I had to double-check that I hadn't done this one already. Disney's done so many poncey cats that they all blur together. Motivation: Shere Khan is the most fearsome beast there is. 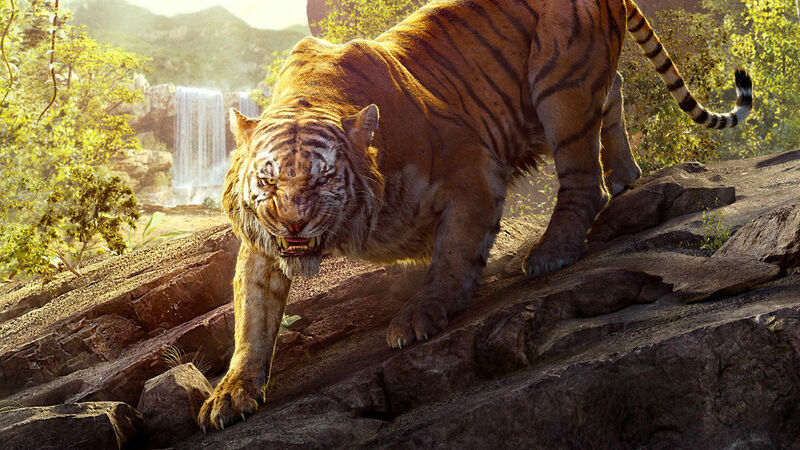 The Terminator of the Indian jungle. But he has one weakness - fear of fire. Why? We don't know. I expect something traumatic in his cubhood. But he's pretty safe because the only way to something starts on fire in the forest is lightning. No one can create fire except for man and there is no man in the jungle oh no wait there's TOTALLY man in the jungle. Character Strengths: Classy, stylish, and supremely confident. 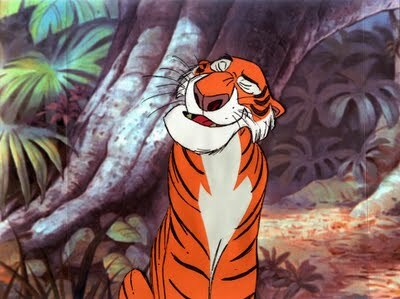 Usually big cats, especially tigers, are portrayed too cuddly, as in Robin Hood or The Lion King. This one, by looking at it, I'm afraid he'll kill me. 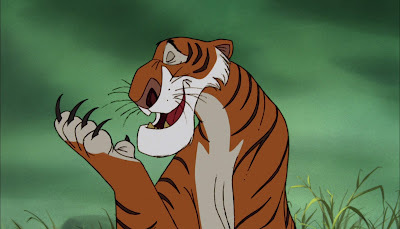 Others treat him like the Queen of Hearts, but where that was fantasy, this is teeth and claws. Evilness: So if maintaining his throne is motivation, the movie does him a great disservice. 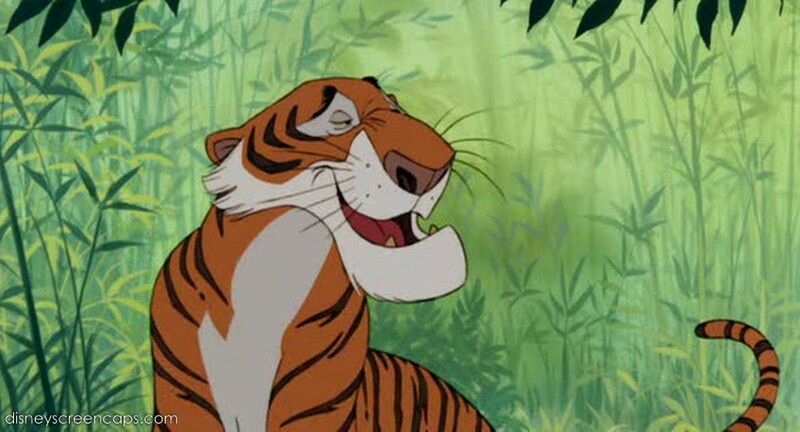 Because while everyone acts intimidated enough, Shere Khan never DOES anything. He doesn't show up until the last fifteen minutes of the movie, and he cannot even frighten the one guy he's gunning for. Not only that, but Baloo and Bagheera overcome their fears when they see Mowgli in danger, making the tiger's reputation sheer bupkiss. Khan is nothing more than a maguffin to keep the characters moving. Tools: He's got nothing but a reputation and claws. He doesn't kill anything. 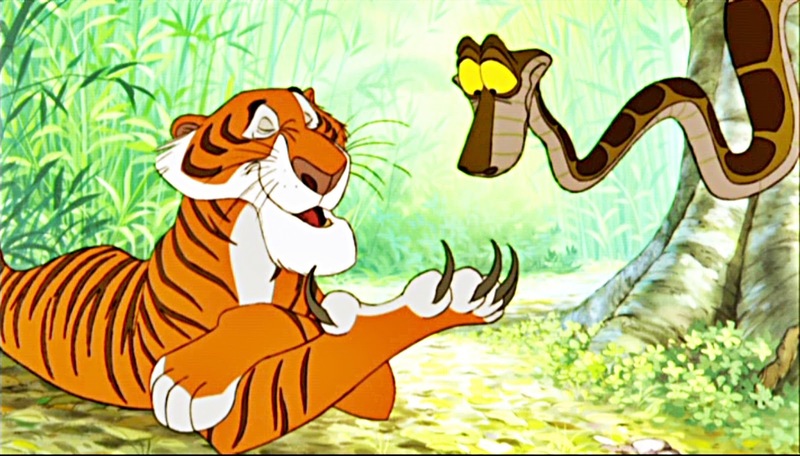 Kaa fools him, the vultures jeer him. This is not Life of Pi. Complement to the Hero: The "idea" behind this conflict is good. 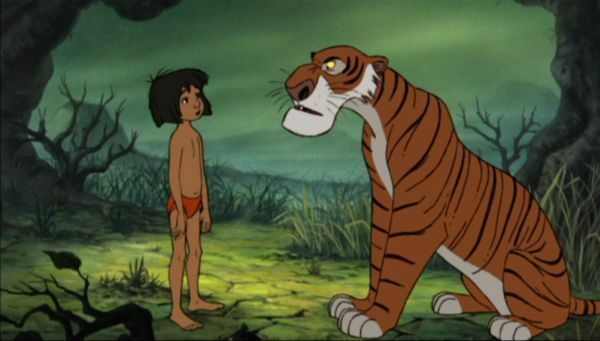 When they finally meet, Mowgli is not afraid and Khan doesn't know what to do. I find that hilarious, but rarely do villains go down in history for not making the protagonist quake in fear. 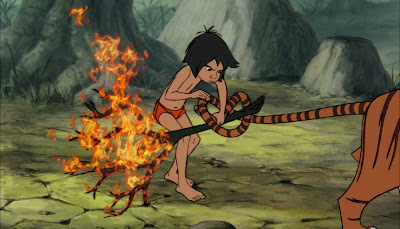 In fact, most of the movie is troubleshooting Mowgli's brash, childish behavior -- teaching him to fear what he should. On the other hand, the lack of fear works out for him, as if he'd run from Khan, I bet he would have died. On the other other hand, he's not exactly confronting his fears, making him hard to root for. Fatal Flaw: Overconfidence. Khan is the six hundred pound gorilla in the jungle (I mean, besides the actual six hundred pound gorilla in the jungle). Everyone treats him like The Mad King. When Mowgli stands up to him, Khan should immediately notice something amiss. Instead, he thinks it's cute. He's even willing to give his enemy a ten-second head start. This, of course, violates one of my favorite rules of combat: never interrupt your enemy when he's making a mistake. 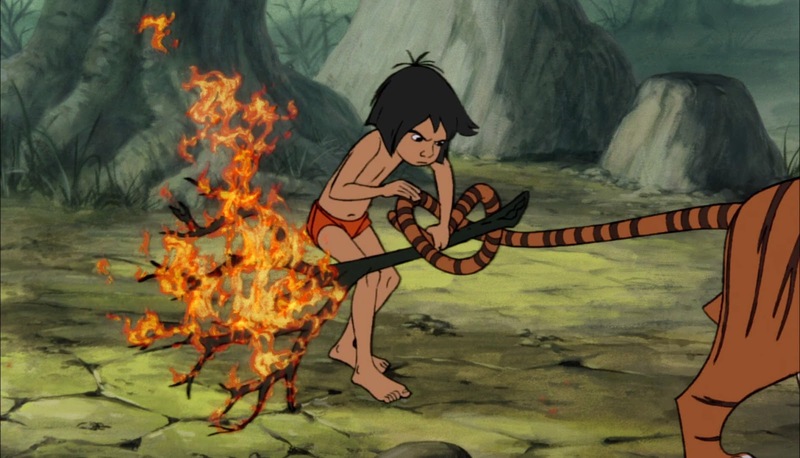 Method of Defeat/Death: Mowgli picks up a stick, daring Khan to attack him. He does, but Baloo CONVENIENTLY jumps in and stops him. 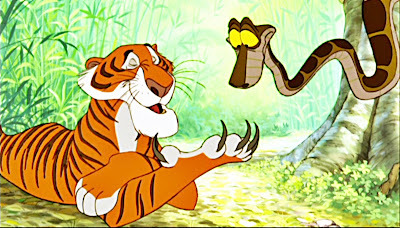 While Baloo has the tiger by the tail, the vultures who Mowgli CONVENIENTLY came across fly him to safety. As a CONVENIENT storm rolls in, Khan shreds Baloo, until a bolt of lightning CONVENIENTLY strikes a CONVENIENT dead tree, setting a CONVENIENT branch on CONVENIENT fire. 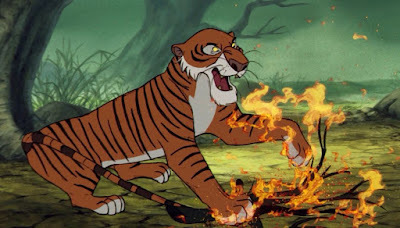 Mowgli ties it to Shere Khan's tail (who CONVENIENTLY doesn't notice) and the tiger runs off, presumably with PTSD for the rest of his life (if he didn't burn alive first).